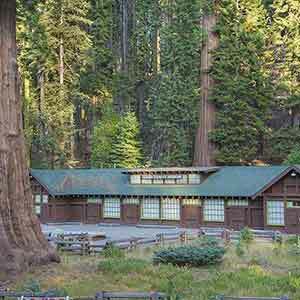 Garfield Grove is in a little-visited area at the southern end of Sequoia National Park. The grove is exceptionally large and in excellent condition, with no development or signs of logging. 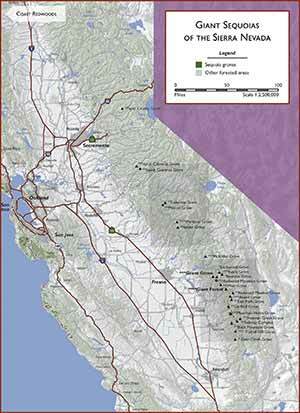 However, the grove is somewhat difficult to reach and most of it has a low density of sequoias. 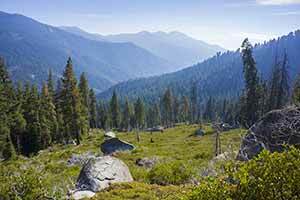 The grove is reached by a challenging hike on the Garfield-Hockett Trail, which includes four miles of climbing among the sequoias. 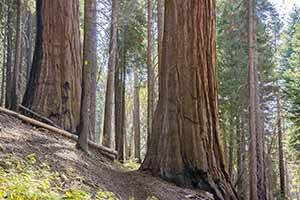 The trail gradually becomes more scenic as it climbs, starting with small and widely-scattered sequoias and ending with a few brief but spectacular collections of large sequoias. 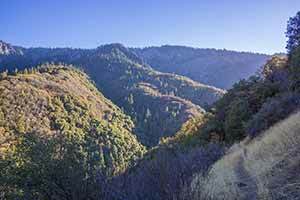 Much of the trail is brushy and the first two and a half miles are infested with poison oak, so thick jeans are recommended. To make things worse, if it’s warm enough for the top of the trail to be snow-free, the bottom will probably be baked in furnace-like heat — usually the temperature at the bottom is about the same as it is in Fresno. One option is to start early in the morning. 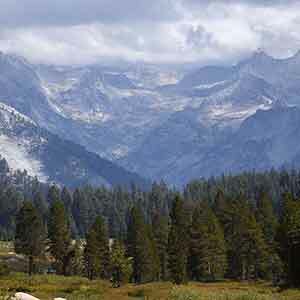 Another is to hike in late October, when there may be a few days without either snow or heat. Also, poison oak is less of a problem at this time. Other than the brush the trail is in good condition; it’s mostly shaded and the average gradient is a reasonable 11%, without any excessively steep sections. The trail feels remarkably remote and is almost completely quiet — other than an occasional distant airplane, there’s no traffic noise or any signs of civilization whatsoever. A sign at the trailhead says that it’s only 2.9 miles to the first sequoias, which I think is a bit misleading, since the first sequoias worth hiking all that way to see doesn’t occur until about 5 miles. Really the hike is only worthwhile if you’re prepared to go all the way to the top of the grove. The hike starts at the end of South Fork Road, about a half-hour drive from the main road into Sequoia National Park and only an hour outside of Visalia. South Fork Road starts out as a wide paved road, but it turns unpaved and becomes progressively rougher as it nears the trailhead. It’s easily drivable in a passenger car, it’s just a little rocky. The road is open year-round. Start at the small parking area at the end of South Fork Road and backtrack a few yards to find the trailhead. The trail starts to climb through attractive oak woodland. The first mile or so seems to be relatively well-used and may even be clear at some times of year, but then the trail becomes somewhat brushy for the next four miles. The brush isn’t especially troublesome, but you’ll spend a lot of time wading through the undergrowth. The woodland gradually changes as the trail climbs, becoming drier-looking with smaller trees. Then, oaks give way to pines, and the woods become lusher and more attractive. 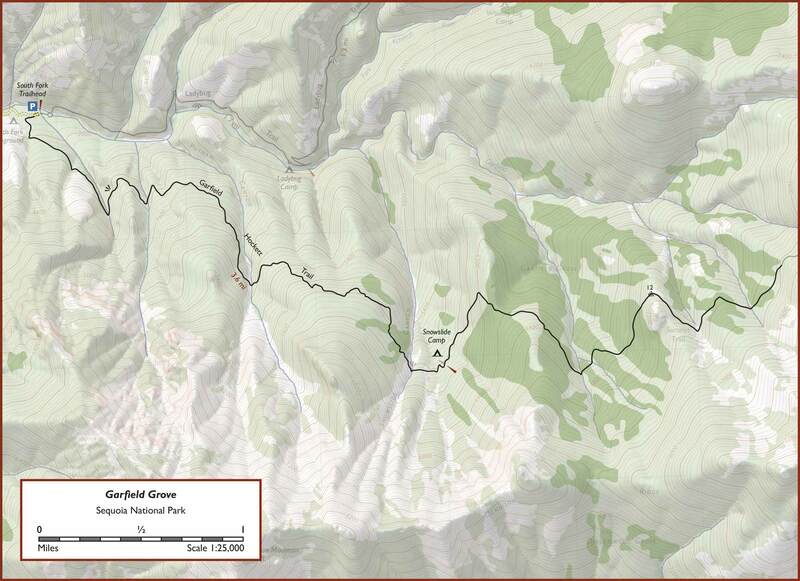 The official start of the grove, 3 miles from the trailhead, is marked not by sequoias but by a smattering of lodgepole pines growing among a dense understory. Soon afterward, a few small, isolated sequoias appear. 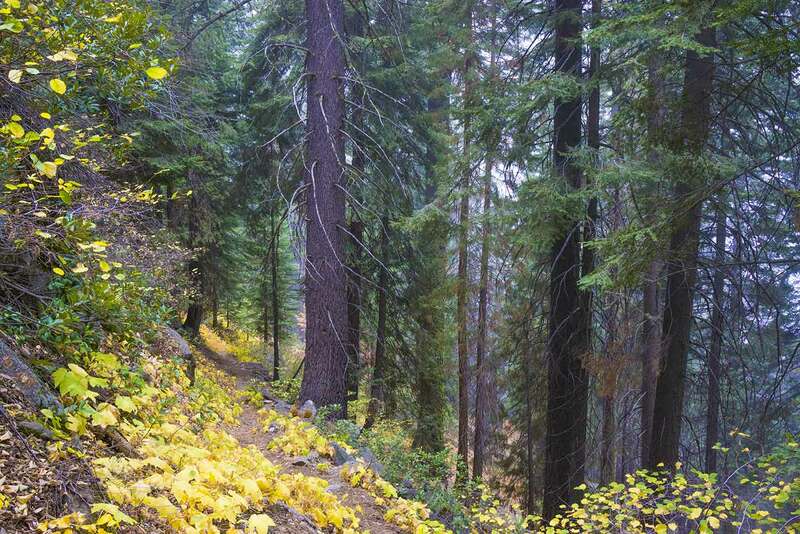 The trail emerges from the woods at Snowslide Canyon, where it crosses an arroyo left by a massive avalanche and landslide in 1867. There’s an impressive view of the rocky concave scar higher up the mountain. Just after the trail re-enters the woods, it passes the unmarked Snowslide Camp. The sequoias start to become more numerous at this point, with some large trees appearing in the dense conifer forest, and the woods continue to get more attractive as the trail climbs. 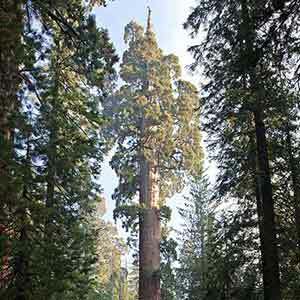 The first really significant grouping of sequoias appears as the trail crosses a small flat at about 5 miles. 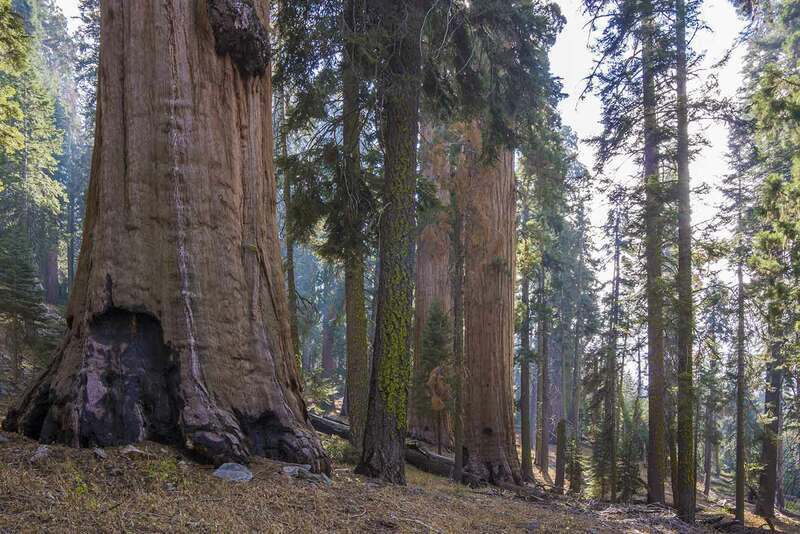 A bit later, around 6500 feet, the woods become more open and there are a few more stretches of old growth sequoias. The best part of the trail is an area of sequoias near the top of the grove. 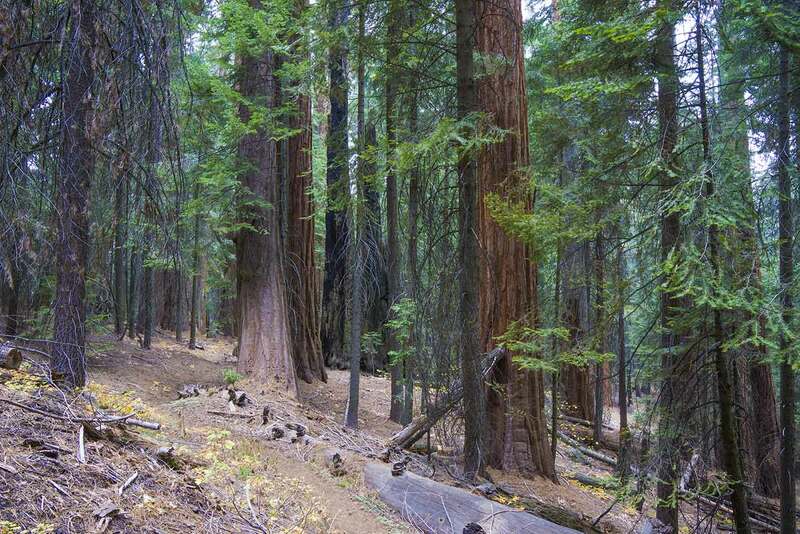 This very attractive mini-grove grows on a relatively flat area and is exceptionally open, with a high density of big sequoias. The trees are all a strikingly light brown. Above this grove the woods once again become dense, so although there’s another cluster of sequoias further up the trail, it’s not nearly as scenic. 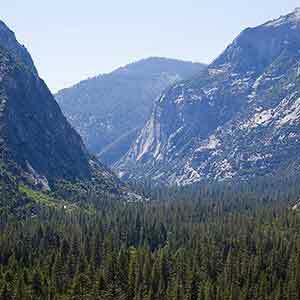 The Park Service website has more details on the South Fork Campground. This forum post has some pictures of Garfield Grove as well as a few of the large off-trail trees. Tarol.com has a description of a hike through Garfield Grove starting at the top. 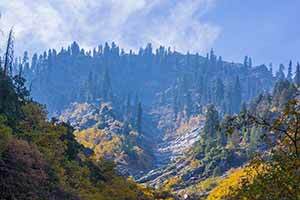 Mike White’s guidebook, Sequoia National Park, has a chapter on the Garfield-Hockett Trail.